I finally found a good way to re-use pharmacy pill bottles! 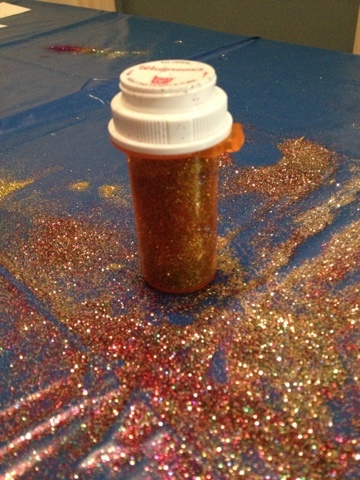 They're perfect for holding the leftover or spilled mixed glitter after a craft project. Today, for the first time in years, I didn't go to church on Ash Wednesday. It's not that I didn't want to go; I did. I meant to go, I planned to go. But my day just didn't go according to plan. I usually attend the noon service (11:00 at my church, but close enough) on my lunch break. That was my original plan for today. Then, I found out yesterday that I had to be at a meeting at work all day today. That meant 11:00 was out. I couldn't do 7:00am because D-Mac, my first-grader, doesn't get picked up by his carpool until just past seven. 8:30 was no good because I had a doctor's appointment then, and I'd already rescheduled it once. I would have to go to the 7:00pm service. I dashed out of the all-day meeting a few minutes early to pick up the boys from daycare so I could take four-year-old Ducky to karate. I tried to call my husband at work to ask him if he could pick up D-Mac after his 6:45 karate lesson, but couldn't get ahold of him. That was when I first began to feel a sense of impending doom. Usually, he makes dinner on Wednesdays so we can all eat during the time between karate lessons, but today he got stuck working late. So I arrived home to an empty house with two hungry boys, no dinner plans, and only half an hour before we had to leave again. I probably should have punted at that point and heated up some corn dogs, but I was feeling contrary so I decided to actually try and cook dinner myself. This turned out not to be such a good idea. I barely finished a quick chicken stir-fry before we had to dash out the door. There wasn't time to actually eat what I'd cooked. Fortunately, my husband was home by then and had the forethought to heat up a corn dog for D-Mac to eat in the car. I was wearing my velour sweatsuit and didn't have time to change for the church service, so I took ten seconds to grab a pair of respectable pants, some black boots, and a nice sweater out of my closet. We arrived at the karate studio only a couple minutes late for D-Mac's class. I changed into my church clothes in the studio's tiny bathroom and hustled back to the car. I looked at the clock at that point and saw that I had less than ten minutes before the last Ash Wednesday service of the day began. I thought about driving downtown as fast as I could, finding a parking place, and maybe managing to get into the church before the sermon. I thought about getting home after 8:00 with the boys' Valentines for school still not addressed and staying up long past their bedtime to get them finished. Completely defeated by the demands of the day, I drove home and changed back into my sweats. I helped Ducky put together his Valentines. I washed some dishes. I picked up D-Mac from karate, then helped him address his Valentines and finish his homework. I put the boys to bed and started a load of laundry. One thing I love about the church calendar is how it makes time for everything important throughout the year. There are times for celebration, times for repentance, times for remembering the past, and times for looking to the future. But I live in the secular world, which runs on its own calendar. Maybe if I lived in a monastery my life would revolve around the daily offices and the seasons of the church. But I have a full-time job and two kids and all the responsibilities those imply. The world is going to keep on chugging along as it always has. It's not going to pause for me, or for anyone else. If I need some sacred space in my daily schedule, I might have to just find it where and when I can. 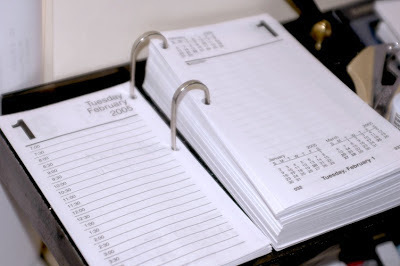 As much as I love following the church calendar, I need to remember that it's only a guide, a way to remember to fit everything important in during the course of the year. If I can't make it to a church service on Ash Wednesday, I can still carve out time to pray and meditate when the demands of my life have quieted. It's late now. Everyone else has gone to bed. Finally, I can make some time to observe this holiday, to mark the boundary between a time of celebration and a time of reflection. Tomorrow will come regardless, with its demands on my time. But by reserving a small sacred space in my day, I can follow two calendars, the sacred and the secular, and live in both worlds simultaneously.